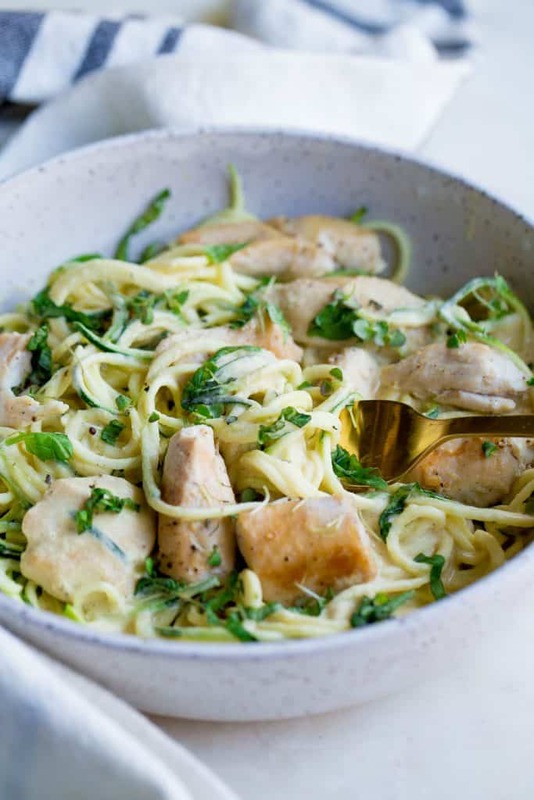 You’ll love this dairy-free, lightened up variation of Chicken Alfredo! Serve over vegetable noodles for a complete Paleo dinner the whole family will love! I can’t remember the last time I had real alfredo sauce, I just know that it probably tasted divine but made my stomach hurt. You too? What’s not to love about a creamy garlic and cheesy sauce? It tastes so good, but doesn’t ever sit well with my digestive system. The heavy cream, butter, and cheese is just a little too heavy for me to enjoy. So I’ve been on a mission to re-create a Paleo variation. Something to feel comfort food-ish, but without the heaviness! I recently came across this vegan alfredo from The Vegan 8. It looked fairly simple, had fantastic reviews, and I thought it would be a perfect dinner with some chicken. So off to work I went creating a dreamy, creamy, cashew alfredo sauce with flavorful garlic……. I’ve gussied up the version to include more garlic, and even a tad bit of tahini to get it even more creamy. And I pretty much love it. It may have a permanent place in my fridge of sauces that I cannot live without. I think it’s important to let you all know…..This doesn’t taste like an exact replica of alfredo sauce. That is pretty difficult to do without dairy products. However, you still get the same “I want to lick my plate clean” comforting feeling from this creamy garlic flavored sauce. It’s about as close as you can get! It was perfect over zucchini noodles, my husband enjoyed with potato noodles. Also, it was super tasty with my Roasted Broccoli, but would also be super yummy with some earthy garlic mushrooms. I do want to give you a few important details. There really is no substitution for the ingredients below, I cannot vouch for the consistency or taste if you change things up. I have made this a few times to get it just right, and one super important detail is to ensure that you soak your cashews in hot water for long enough. At least an hour is preferred. A high powered blender is also important, a food processor won’t work. 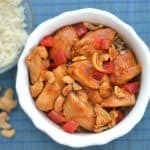 If you want the smoothest sauce possible, you can soak the cashews for several hours and even overnight (especially if you are unsure about the power of your blender). I did put fresh basil as optional, but it’s kind of necessary! It tastes soooooo good with a healthy sprinkle of basil, and cracked black pepper. Soak your raw cashews for at least one hour in hot water, up to 12 hours. Drain and set aside when ready to cook. Heat a large skillet to medium heat. Salt and pepper your chicken breast strips, If you have large chicken breasts, cut into smaller pieces so the cook time is shorter. Add 2 tbsp avocado oil to the skillet, then add 2 cloves minced garlic. Heat the garlic for just one minute until flavorful, then add the chicken to the skillet. Cook for 3-5 minutes per side, or until chicken is cooked all the way through. Do not overcook. Set aside to a plate and cover with foil. Add the remaining avocado oil to the pan. Add in chopped onion. Let saute for 2-3 minutes to give the onion a bit more flavor. Now add the remaining minced garlic, then add in 1 cup chicken broth. Let the broth and onion/garlic mixture simmer for 8-10 minutes or until onion is completely soft. You may need to add in a bit more broth to prevent any burning. But the broth should be almost completely evaporated once the onions are ready. Place onion/garlic into your blender. Now add the remaining chicken broth (about 1 cup), lemon juice, tahini, nutritional yeast, and cashews. Mix in your blender on high speed until you have a smooth and creamy sauce. This may take a few minutes. You can prepare your noodles while the sauce is being made. 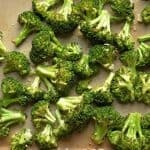 Once the sauce is smooth, adjust with salt and pepper to taste, or even add in a bit more lemon if the nut taste is strong or more nutritional yeast (for cheesy flavor). If the sauce is cool, you can heat up in a small saucepan to serve (or microwave). Serve over vegetable noodles with fresh cracked pepper, salt, and fresh basil. *The nutritional yeast is used as a cheese substitute. It can be found in some grocery stores in the health food section, or online in places like amazon or thrive market. Those are lovely flavor combinations in that recipe – I bet this tastes better than alfredo! Hi Sharon, it’s a deactivated yeast that is packed with nutritional value (lots of B vitamins). It has a nutty and cheesy taste that is added to recipes to give that “cheese” flavor without the dairy products. It can be found in the health food section of many grocery stores, online, or at all health food stores. Oh, how I’ve missed alfredo!! This recipe is genius! Yum!!!! 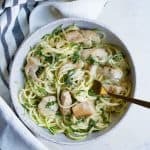 Love dairy free alfredo and zoodles! Loving you thick spiraled zoodles too! 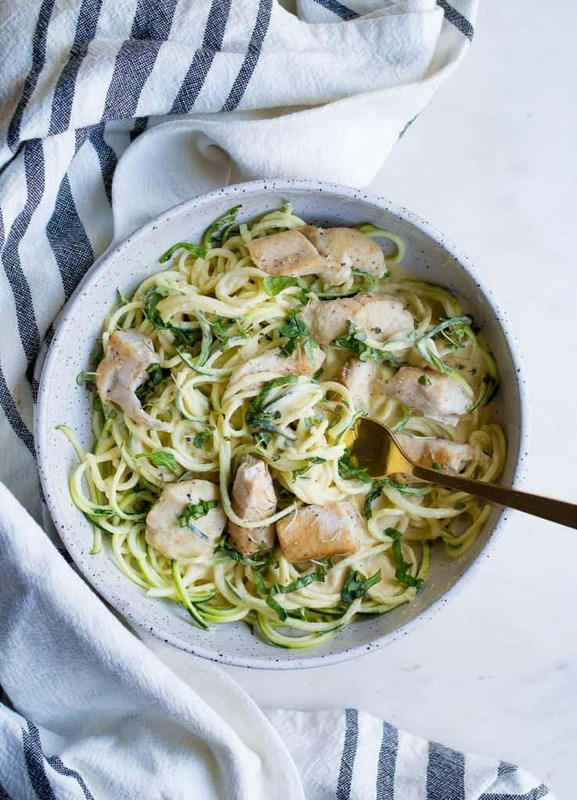 Love garlic alfredo flavor and this is such a wonderful everyday simple Paleo dish. Thank you for sharing ! haha, you sound like me – looking at all these amazing vegan recipes and figuring out how to gussy them up and incorporate meat into them. This one looks awesome though and will definitely be trying it! This is the perfect simple healthy meal. The sauce sounds amazing!! So yummy! I love Alfredo of any kind, this sounds so delicious! So healthy served over veggie noodles too! I really miss pasta and alfredo sauce so much! So nice that I can have this version and it looks as good as the real deal! It’s the perfect meal for a “pasta” fix!! Love that you use tahini in the alfredo sauce! Can’t wait to try this. Thanks Becky! I love tahini, it’s so yummy 🙂 Hope you enjoy! This looks so good and creamy! I miss chicken alfredo and definitely need to try this! I haven’t had alfredo in ages for the same reason, it’s just not worth it most of the time! I love how flavorful this looks, and I’ll bet it beats alfredo hands down! When you make you zoodles, do you salt them and let them drain? Hi Randi, I just make my zucchini noodles raw without draining. Sometimes I will salt them, it just depends on the sauce I’m serving with. With this recipe I do add a bit of salt! Hi Amy! I am eating a grain free/dairy free diet now, and just made this for dinner tonight. It was AH-MAZING!! I can’t say enough good things about it. So happy to have an alfredo sauce my whole family can enjoy!! Yay!! So glad you enjoyed it April!! Just made this last night. 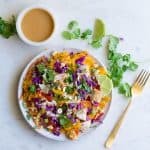 I’m trying all of your recipes now and cannot get enough of them! Hubby said he liked this more than the traditional. I was really skeptical yet pleasantly DELIGHTED. That makes me so happy!! Glad you are loving it all! How did you get the noodles so thick? 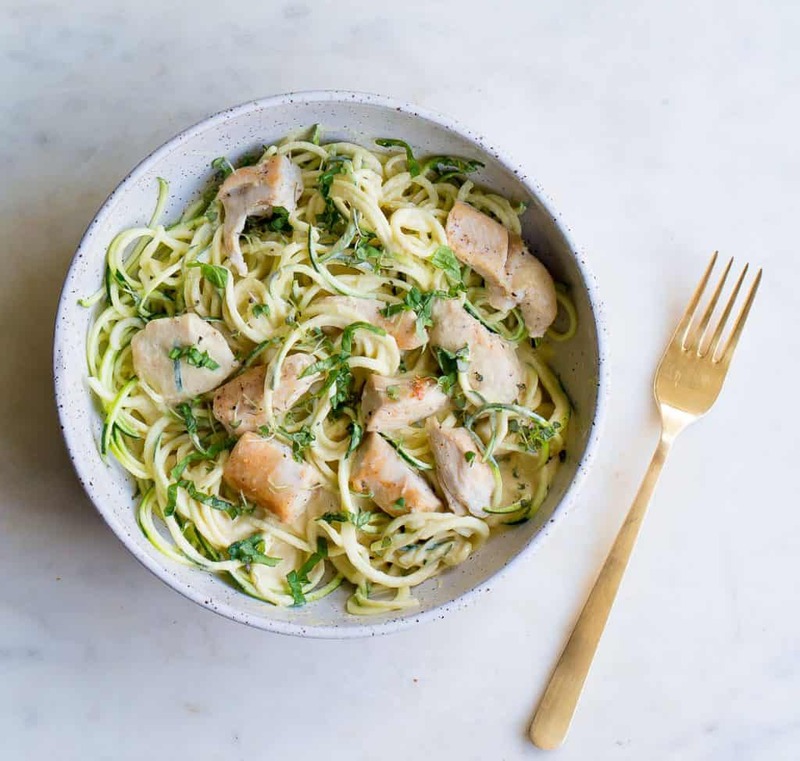 What spiralizer did you use? Flavor was great!! I did find the sauce a little thin so going to try to add some more cashews to thicken up! Otherwise was an awesome paleo dish! Yay!! So glad you loved! I was thrilled to try this recipe. It turned out really good too. My family had regular alfredo and I made this for myself. I wasn’t sure if I would love it because I haven’t ever tried a sauce like this, but I was pleasantly surprised. I used spaghetti squash as my ‘noodles’. what can you use besides cashews? Can you leave them out? Ihave everything but the cashews. You could leave out the cashews, but I don’t think it will taste very good. They are there to give the sauce a rich, satisfying, creamy texture. Without it, you have a more water based sauce.